The Easter Bunny came to our house this weekend and brought Felicity some new “Doc McFeFe” pajamas. You see, Felicity is OBSESSED with Doc McStuffins right now, so I thought she might enjoy a Doc shirt. However, I’m not a huge fan of character apparel so I had to get creative. Then, I remembered that I could personalize just about anything on Etsy. One thing led to another, and I found myself at The Creators Studio. I decided on these super soft pajamas that you’ve probably seen Felicity wearing before (Christmas pajamas and the pink/white ones with her monogram) with a custom doc applique that looked more like Felicity…and adding her name. When she opened them up, she immediately started smiling and saying “doc doc.” She even kissed them and gave me a hug. Mommy…I mean Easter Bunny…win. I let her wear them to bed on Easter eve. And while I don’t have any pictures to share of the big reveal (because I didn’t want to ruin the moment), trust me, it was priceless. 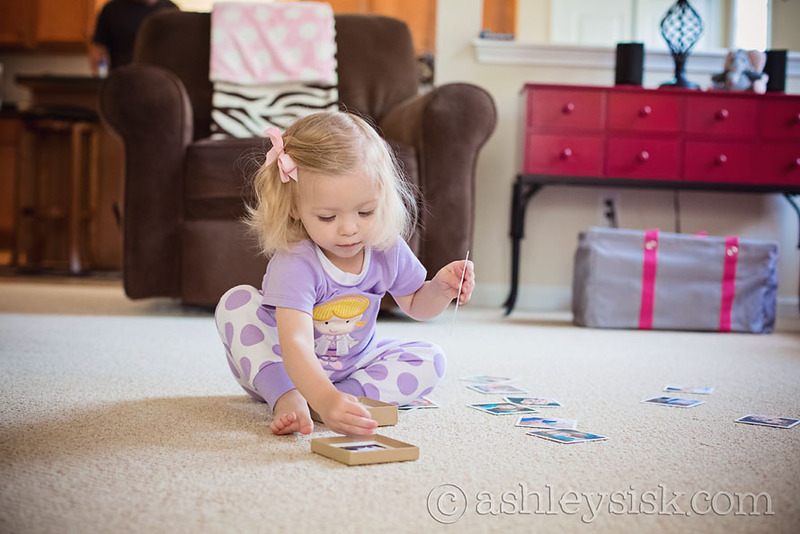 Now, these photos were taken on Easter morning while she played with the memory game we got from Pinhole Press. She doesn’t quite get the concept of flipping the cards over and matching them, so we’re currently using them to develop her recognition of family members. She already knows her grandparents and cousins really well…now just to work on her great grandparents. Good times. Anyways, that’s all for today. See ya later.